As this year's My Stocking comes to an end, thanks to all who participated and thanks for reading! 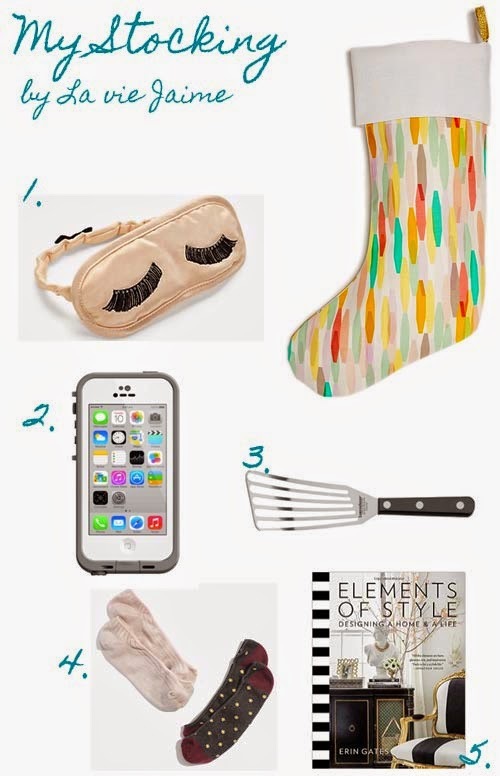 Here is what I am hoping for in my My Stocking. Check back here Friday for my December faves of the month. Have a Merry Christmas! 1. Eyemask - love the lashes. 2. Waterproof iPhone case - for using when I go to Punta Cana on Saturday! 3. Slotted turner - to up my cooking skills. I want that Elements of Style book!! Happy holidays!! I'm loving that stocking! Where is it from? Loved following the series this year again, Jaime! Have a Merry Christmas! the actual stocking is super cute, too! !